I am a bit under the weather thanks to the blizzard at Mumbai right now. The temperature dropped below twenty degrees. Centigrade! But then I am Bong. Genetically conditioned to be a hypochondriac. 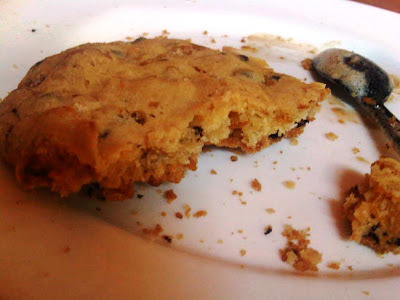 Felt like a steaming cup of coffee and a good soft chocolate chip cookie to fix me up a couple of days back. Thought of my options. Most Mumbai coffee shops are non starters when it comes to cookies - Barista, CCD, Costa even Candies (!). 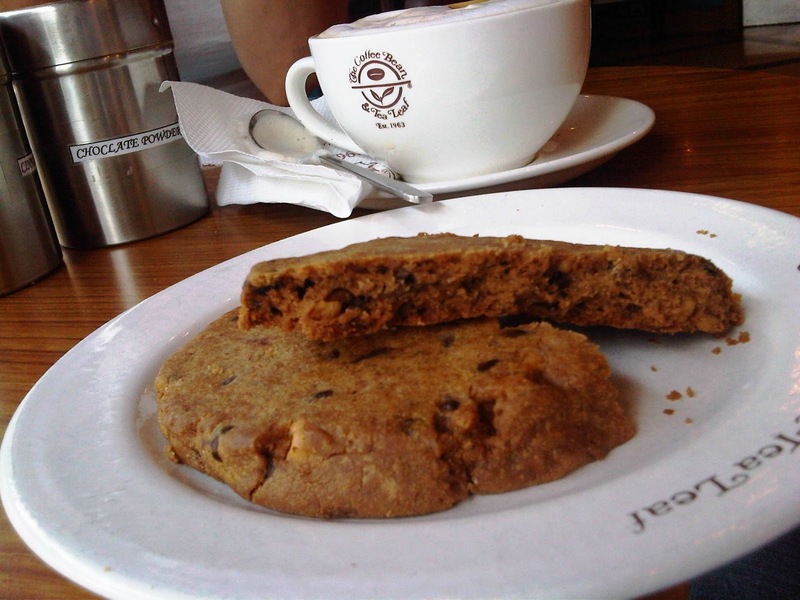 I like the chocolate chip cookie at Coffee Bean and Tea Leaf but a kilometre seemed a bit too far to travel in this state. Went to Gloria Jean's next door to home. Love the coffee there. Love to sit on the cosy sofas. I tried the chocolate chip cookies. Rock solid. Sushil Kumar, wrestling champ might have better luck, but I couldn't muster the strength to break it. I still wanted good cookies. We don't have a Cookie Man at Bandra. So K took me to the new Moshe's at Bandra. We were greeted at the cookie cupboard shelves by a thin, unassuming man who asked us what we wanted and then politely pointed us to the walnut fudge cookies of Moshe's. Definitely the best cookies to be had for your money at Mumbai. I also ordered a humus from a waiter who passed by, Picked up an interesting looking olive foccaccia bread. Then on a hunch asked another waiter "is that Moshe's". Turned out that the diminutive man who greeted us in the beginning was Moshe Shek, celebrity Chef and Restaurateur, himself. I went up to him and introduced myself as a fan of his cookies. (sounds weird doesn't it). Moshe smiled and said that the cookies taste best when heated for 7 seconds in the micro. The best cookies according to him are the ones which do not use too many ingredients. We spoke about focaccia bread and Yazdani Bakery. Turned out that one of the current owners of Yazadani was Mr Shek's classmate at Sophia's. "Their stuff is good", he said. I complimented him on the mezze platter at Moshe's. I told him about how I was looking for the non pasta stuff when I came for lunch last time. Moshe said that they keep pastas specially for vegetarians but recommended the trout and chicken in figs (if I remember right) for me. On the way out K and I tasted the chocolate dense cake. We let out a sigh of a very adult pleasure in unison. This was wicked stuff. You just take a bite, place a piece on your tongue and feel it slowly melt down. Sweet mother of God! Came home and discovered that the olive foccaccia was as soft and adorable as it looked. The olives added a bite of cherubic mischief to it. This was great bread. The hummus? Perfect consistency and balance of taste... the sort of thing which tells you that being a desert nomad needn't always be bad. Ironically I wasn't carrying my camera on both my trips to Moshe's. Plus I just love photographing foccacia...love the textures and the balance of diverse colours...a photo shoot followed at home... you can see all the pics on this album on the Finely Chopped Facebook page. And the cookies. Close your eyes and imagine the most sensuous tastes your have ever experienced. Let your imagination run wild. Think satin smooth. Think cream. Think textures. Think sweet. Think salt. Every forbidden pleasure you dreamt o as you grew up. Imagine nibbling into the cookie. Feel it give in in your mouth. Making your every sense leap up in ecstasy as it trickles down, titillating you all the way down. Feel loved like you never have been. Yes, that pretty much sums up the walnut fudge cookies of Moshe's. You are such a good narrator! Am tempted to head to Moshe's! Did remember the Chocolate Chip Cookies freshly baked by the Albertsons' store in the US! 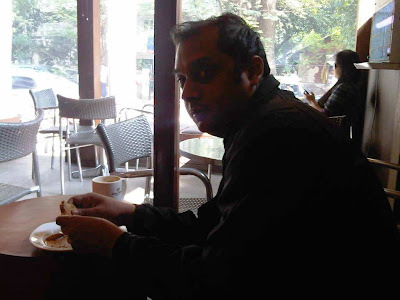 I have been to Moshe's in Delhi about 6 yrs back!!!! And I remember the food to be great.. I remember eating some pilaf kind of thing in a pot!! I haven't been to the Moshe's at Bandra but I love the one in Colaba. They make awesome baked cheesecakes. PS: Looks like Theo has competition. Oh wow - look at that hummus and foccacia - makes me drool!! I just baked some white chocolate and macadamia nut cookies - amazing combination of flavours and took me 15 minutes. You should try baking cookies, if you like them - you can choose your flavour, texture and all that for no fuss at all and not more than 15 minutes spent in the kitchen.